In august 1999 we flew Martinair from Amsterdam to Vancouver; we've beeen regular guests with Martinair to Canadian destinations, until the KLM took that away from them upon the takeover (01Jan09). Our Canadian 'roadtrip' (which this time would also cover a considerable distance over sea!) started with taking in some culture at the University of British Columbia. We enjoyed the arts and crafts of the First Nation. The weather started out a little dismal, warm but a slight drizzle and low hanging clouds painted the day, and so we considered our indoor options. Actually you don't need such an excuse to enjoy the Vancouver Aquarium & Zoo. And indeed, during the afternoon the weather cleared considerably. We also visited Stanley Park and Gastown later on. 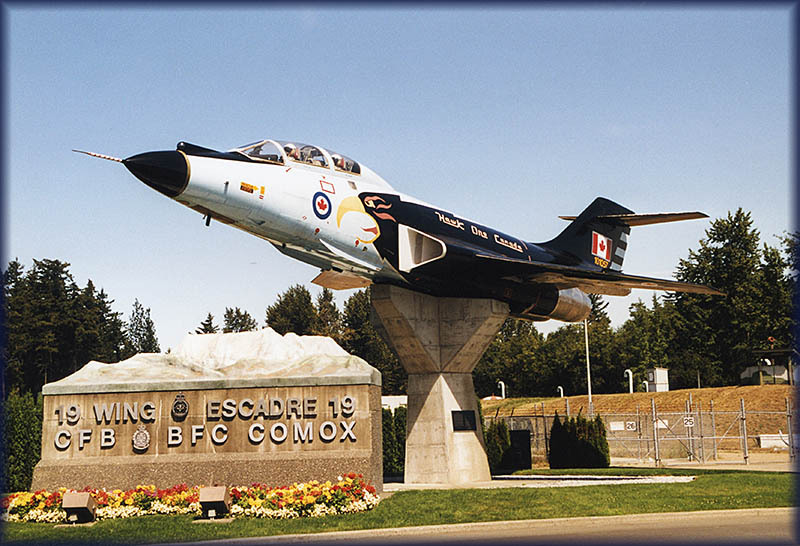 Having an interest in aviation I could not bypass the opportunity to visit the air show at Abbotsford. Unfortunately the air show was slightly disappointing, perhaps it was kept a bit low-key for the war in Kosovo, but I had hoped to see a demonstration of an airtanker (aerial firefighter) dropping a load of water, regrettably that wasn't on the program. The weather wasn't too good for photography either, though the rain stayed away the clouds were low and the light was grey and uninteresting. We took the ferry from Tsawwassen to Swartz Bay on Vancouver Island, which took us out from under the cloud cover.. After a brief visit to the air museum at Victoria, we drove north along a beautiful route. 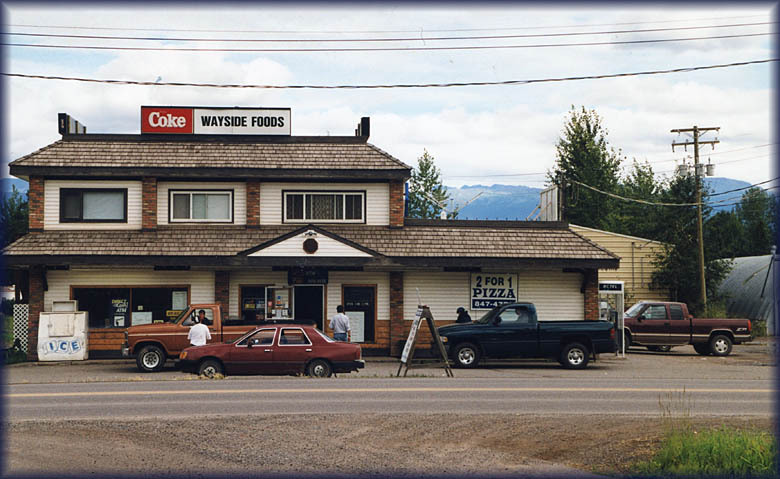 One of the places we noticed was this supermarket located in a huge log building... 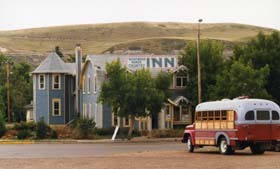 This is the Coombs Emporium & Frontier Town. 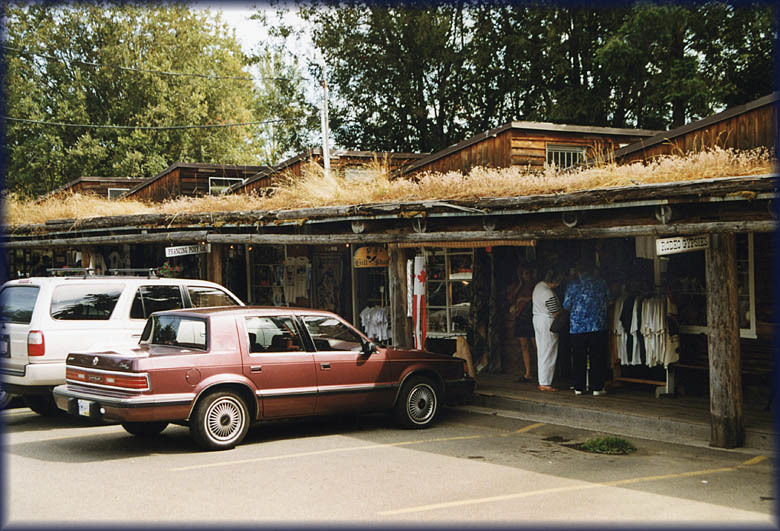 A remarkable building in itself, the roof is so overgrown they had goats grazing on the roof! They sell anything, they even sell a type of cookies I only know from Holland and have never seen abroad. They sell bread, fruits & vegetables, all kind of supplies, souvenirs. We went for the delicious icecream! 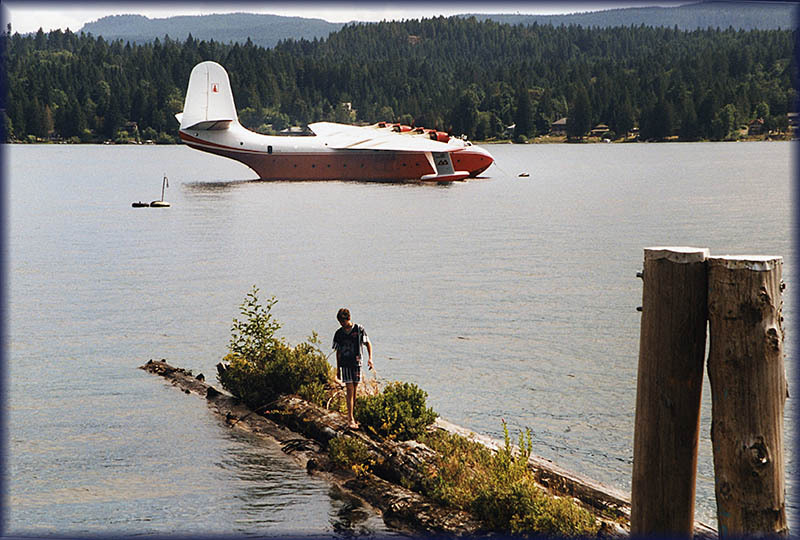 My interest in aviation took me to Port Alberni at Sproat Lake, to see the two Martin Mars flying boats. 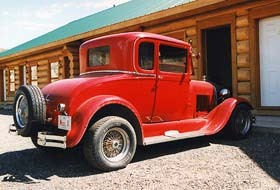 They date back to WW2 and are used to fight forest fires. The logging industry is huge and vital here on Vancouver Island and these two aircraft make sure their capital is safe from fires spreading and going out of control. It was interesting to note that after we were put on board of one of these giants, the interior smelled of soap.. This is because what they add to the water to prevent the water from disappearing in a spray when they dump it over the fire. Logs still travel by water, an old tradition. We also visited the military air museum at Comox Air Force Base. 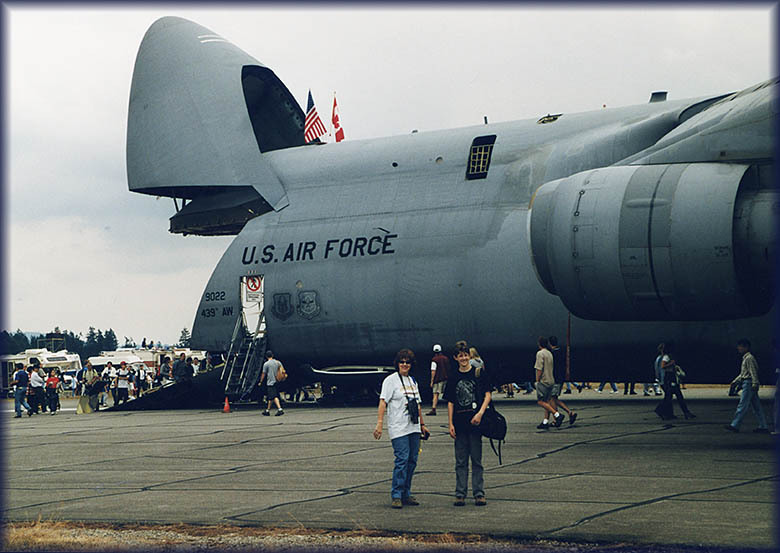 I had also arranged for a base tour, although military aircraft were not my passion any more. The visit was cut short a little, because aircraft and staff were involved in a situation: a foreign ship was followed along the coast by aircraft, because the ship was suspected tod dump people out to sea to see them rescued and hope for immigration facilities. Illegal human trafficking, a sad and despicable trade. 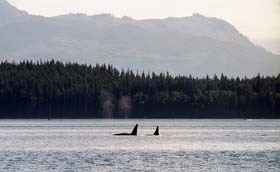 We drove to Telegraph Cove to take a boattrip to see the Killer Whales. Telegraph Cove is one of those nice, semi-isolated places and we walked around a bit, waiting for our boat (the Gikumi) to board. 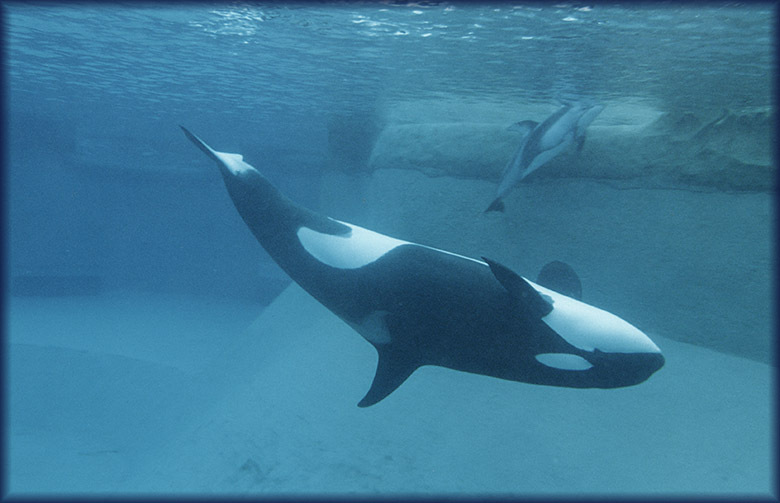 The outlook wasn't good, the staff was very honest about it: the Orca's had probably been scared away because no sightings had taken place in 14 days.. Anyway, there is other marine life and birds to see too, such as dolphins, porpoises, harbour seals, Stellar sea lions, etc. One has to wait and see. Fortunately, we did strike lucky and some orca's were spotted. There are different kind of Killer Whales, among them the 'Residents' and the 'Transients'. So the 'Residents', who have their specific area more or less, were probably scared away. We encountered a pod of 'Transients, those who roam the entire coastline and it was sheer luck to find some of those. To respect the animals the boats keep a considerable distance, something we respected. 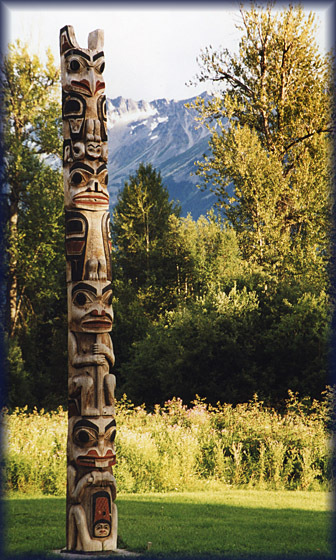 The name Gikumi comes from the Kwakwala language and means 'The Chief.' 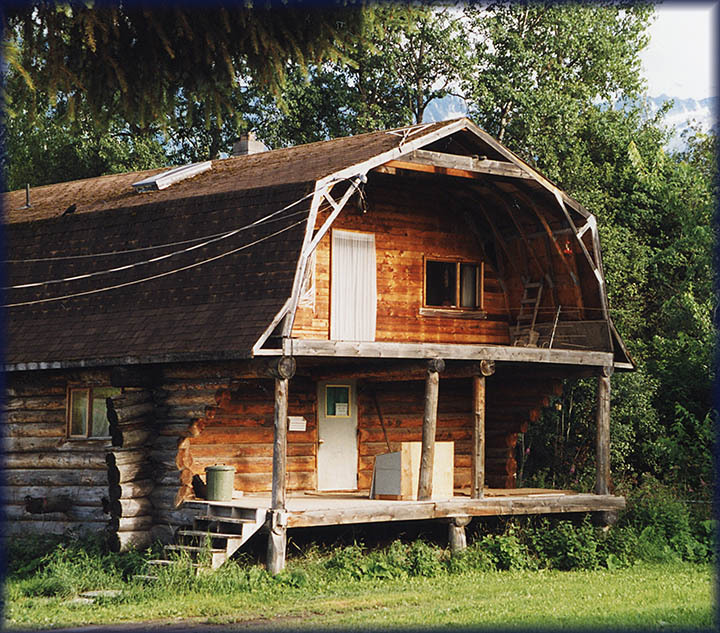 The Gikumi was built in 1954 in Vancouver for Mr. Fred Wastell, the owner of the sawmill and the whole town of Telegraph Cove until his retirement in 1980. 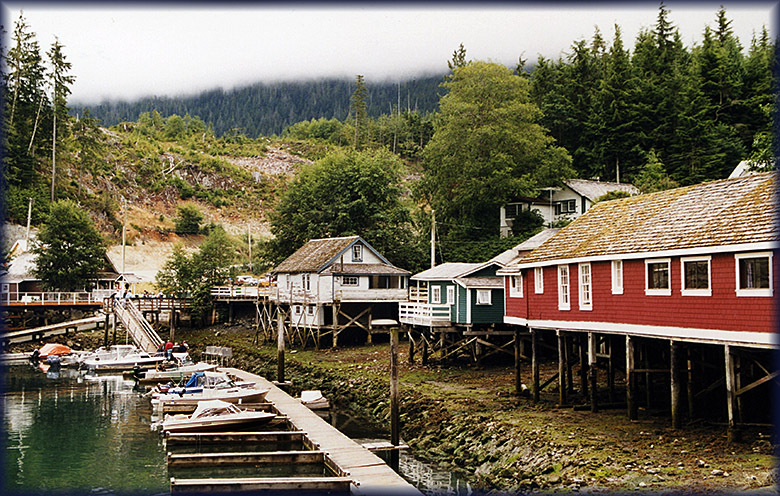 Telegraph Cove has been the boat’s home since 1954. It was originally built to tow logs to the sawmill in Telegraph Cove. It also carried lumber and dry goods all over the British Columbia coast. Stubbs Island Whale Watching took over the boat in 1980 and then started offering whale watching trips. It’s a comfortable wooden vessel that’s got a warm feeling and provides a great platform for whale watching. The Gikumi is 17 metres (just under 60 feet long) and is about 5 metres wide. There is an on-board lavatory and heated, wood paneled area inside. In addition, there is also a hydrophone (underwater microphone) to listen to the whales’ vocalizations during the cruise. Most of the seating is out on deck, and we recommend that people bring rain gear and dress in layers. 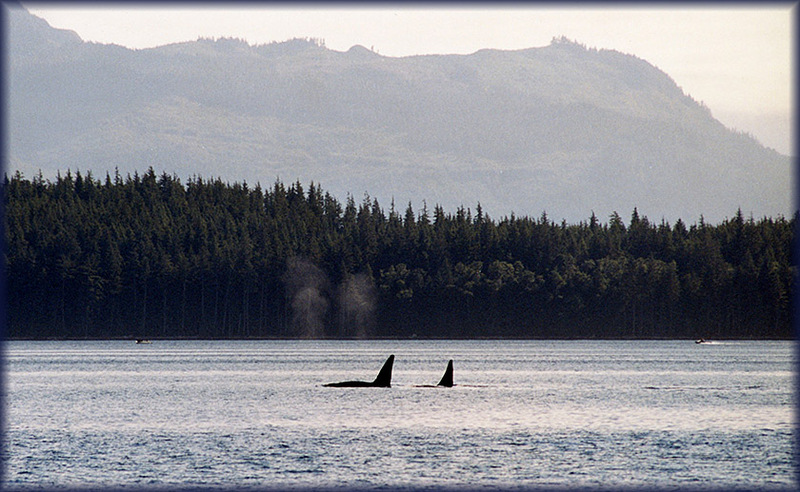 British Columbia's first whale watching company was established in 1980. 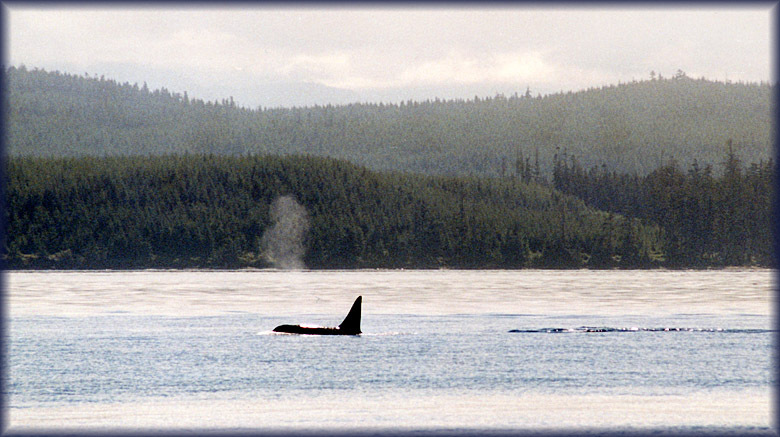 Orca (killer whales) and many other marine mammals frequent the Johnstone Strait area. Stubbs Island Whale Watching is locally owned and operated by Jim and Mary Borrowman. Telegraph Cove is located on the Northern end of Vancouver Island, BC, Canada. After our trip out to sea we continued to Port Hardy, to take the ferry to Prince Rupert early the next morning. 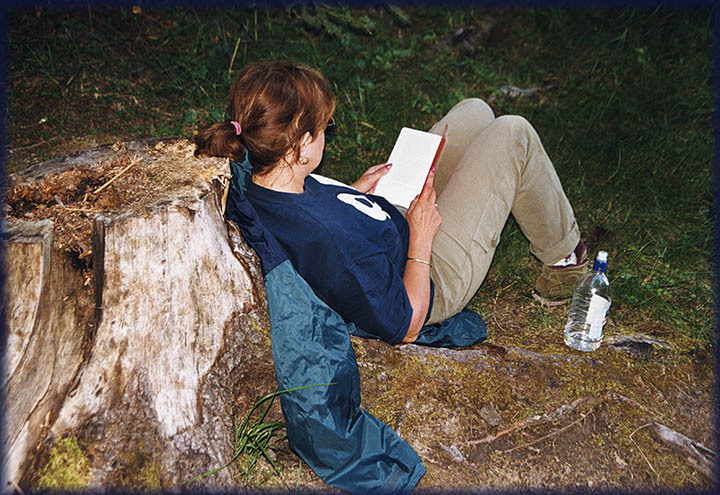 I never make reservations and we arrived late in the day since the boattrip had taken longer; as a result we found accommodations full. Except for the bridal suite in the Quarterdeck Inn ! Huge ferryboats ply the coastal routes. 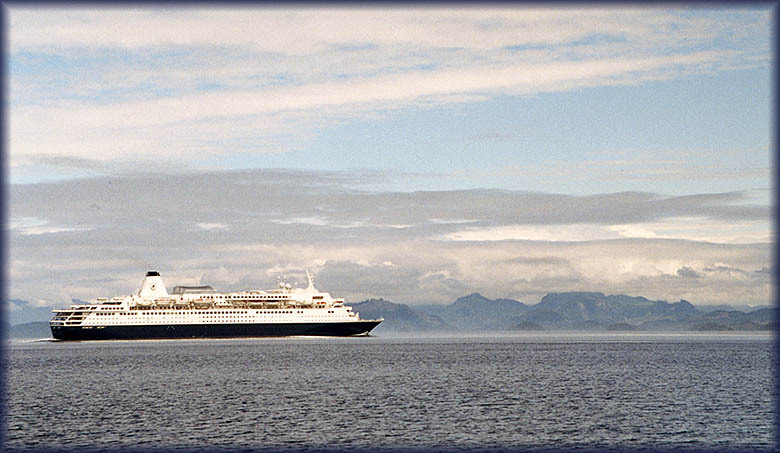 Our trip was a relative short one as cruiseboats continue to Alaska. I had hoped our trip would have the same qualities as a cruise, but the coastline was devoid of any wildlife (wooded, steep rocks mostly) and often hidden in a veil of drizzle... The 15 hours on board was spent reading a hugely amusing Bill Bryson book and playing cards. 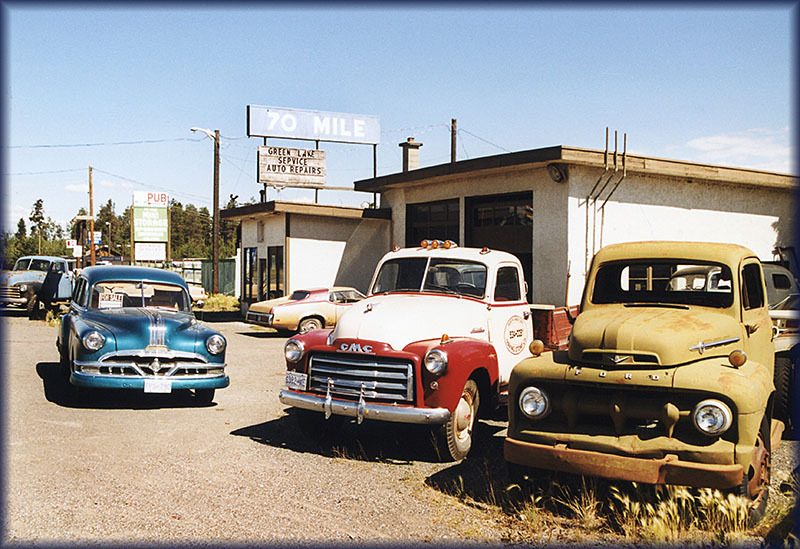 My interest in 'propliners' took me to Terrace, not far east from Prince Rupert on the Highway 16. Hawkair is based here and uses the vintage Carvair (a converted Douglas DC-4, see report) as well as an equally vintage Bristol Freighter for hauling cargo to/from a gold mine. 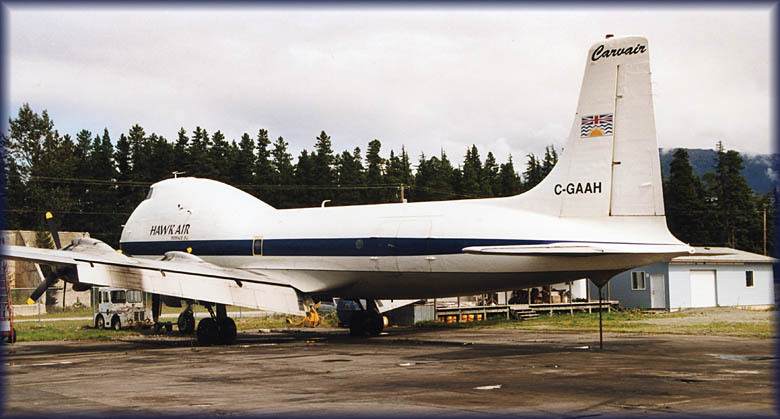 Years ago (this page was compiled in July 2009) this mine was closed down, the Carvair was sold to Alaska (was subsequently wrecked during a landing) and the Bristol Freighter was donated to the Reynolds-Alberta Museum Transport Museum in Wetaskiwin,ALB. 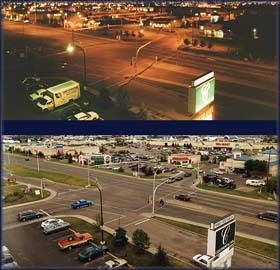 Highway 16 is also known as the Yellowhead Highway, a major east-west highway connecting the four western Canadian provinces of British Columbia, Alberta, Saskatchewan, and Manitoba. See also my 2007 report on a visit to Manitoba and Saskatchewan. 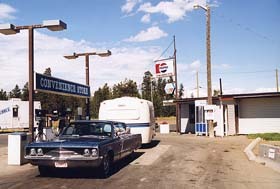 The highway is named for the Yellowhead Pass, the route chosen to cross the Canadian Rockies. Although part of the Trans-Canada Highway system, the highway should not be confused with the more southerly originally designated Trans-Canada Highway. The highway was officially opened in 1970. 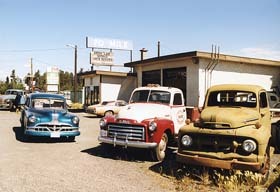 At the time of our visit we saw a lot of real estate for sale, properties abandoned and even gasstations closed shop. 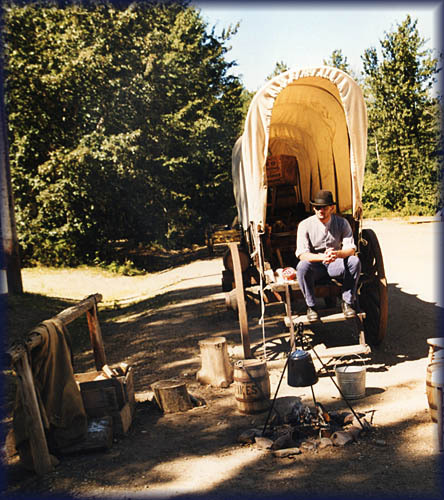 Clearly hard times had descended on British Columbia (it wasn't so evident in Alberta). 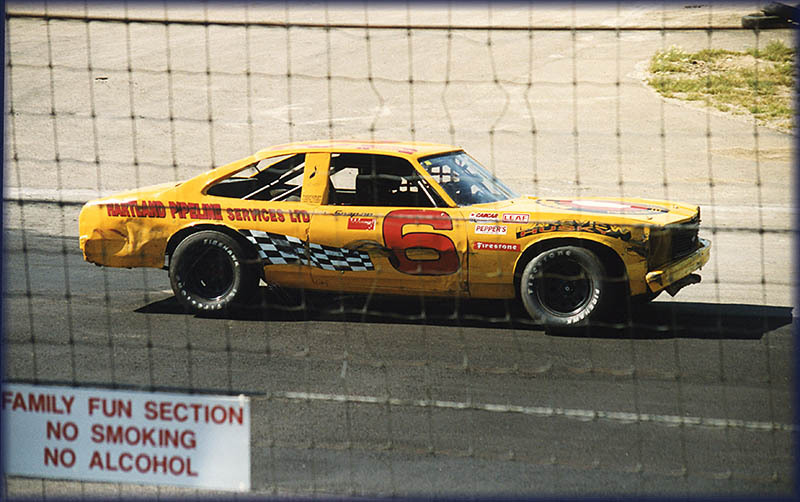 Alamo had given us a good deal on this Chevy Lumina. 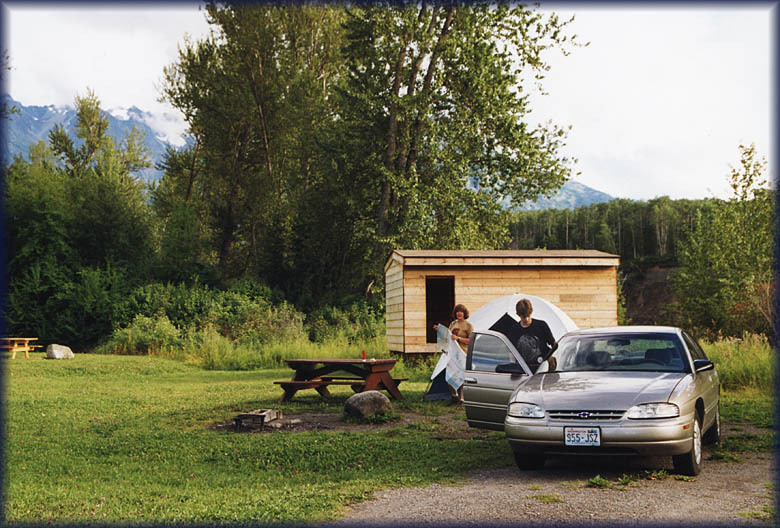 The photo shows our spot on the Ksan Campground near Hazelton. 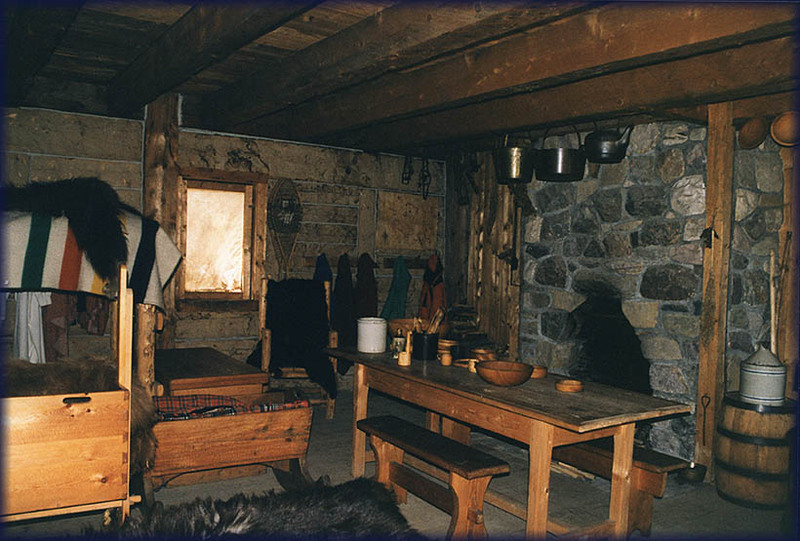 A remarkable logcabin at "Old Town" Hazelton. 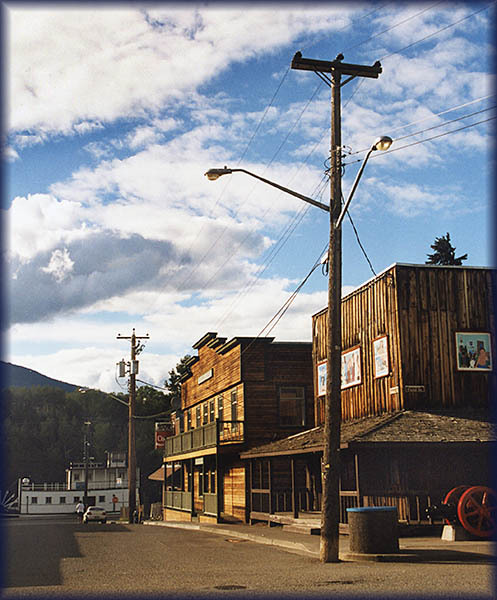 This town had been established 50 years before the realisation of the Grand Trunk Railroad, to connect Prince George with Prince Rupert; it was completed in 1914. There is also a New Hazelton and a South Hazelton nearby, established by people who thought to have found a better location in respect to the railway. New Hazelton is the largest of the three, with a population of... 1.000! We continued east on the Yellowhead Highway, enjoying the endless forests, rivers and lakes in all shapes and sizes. The mountains still had snow. 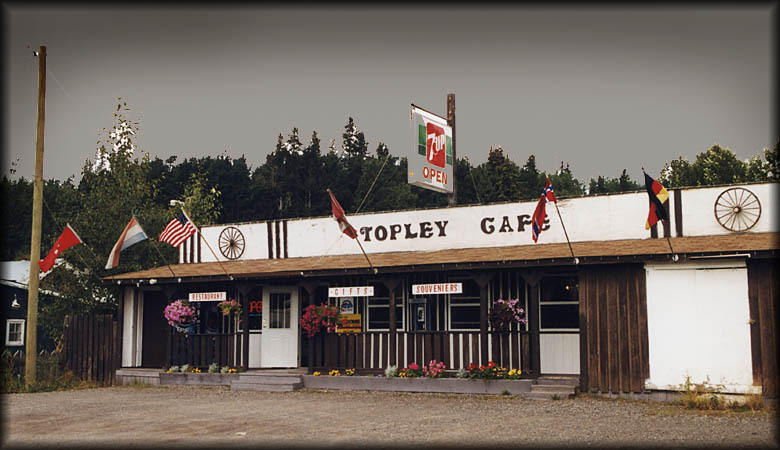 The Topley Cafe was one of the places we stopped for coffee or just to stretch our legs. The Fraser River is the longest river within British Columbia, Canada, rising at Fraser Pass near Mount Robson in the Rocky Mountains and flowing for 1,375 km (870 mi), into the Strait of Georgia at the city of Vancouver. 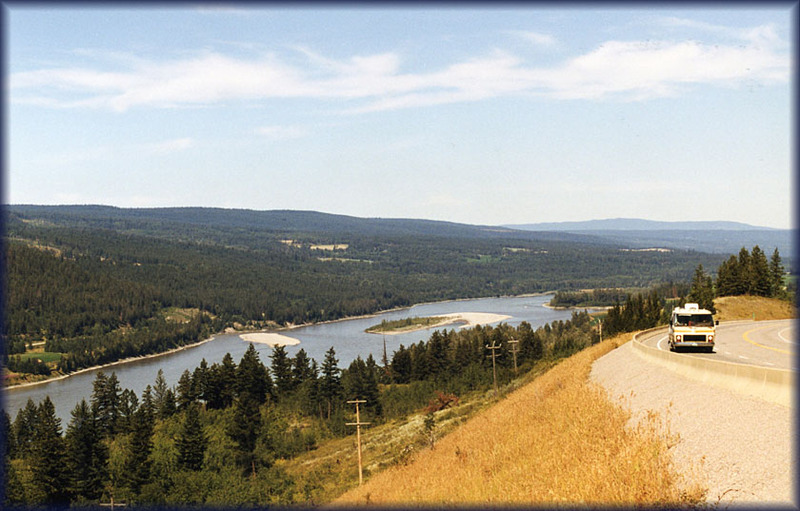 It is the tenth longest river in Canada. On June 14, 1792, the Spanish explorers Dionisio Alcalá Galiano and Cayetano Valdés entered and anchored in the north arm of the Fraser River, becoming the first Europeans to find and enter it.The existence of the river, but not its location, had been deduced during the 1791 voyage of José María Narváez, under Francisco de Eliza. 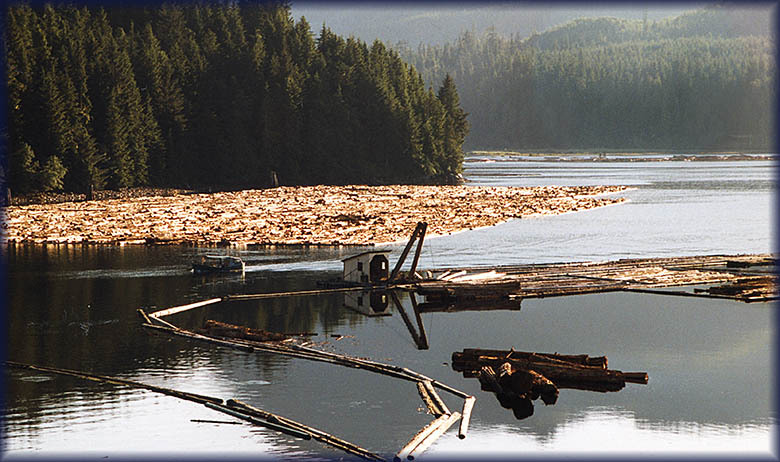 In 1828 George Simpson visited the river, mainly to examine Fort Langley and determine whether it would be suitable as the company's main Pacific depot. 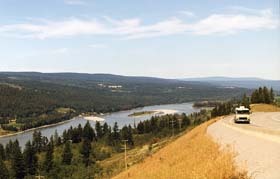 Simpson had believed the Fraser River might be navigable throughout its length, even though Simon Fraser had described it as non-navigable. 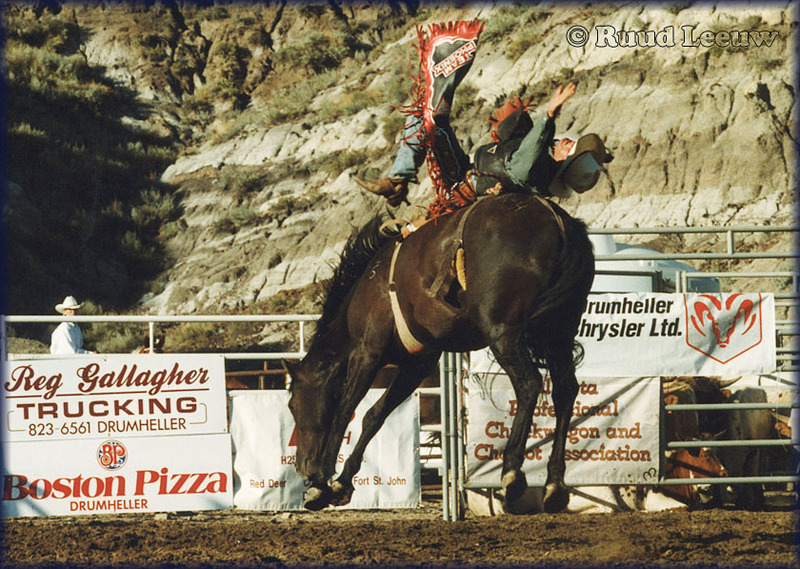 Simpson journeyed down the river and through the Fraser Canyon and afterwords wrote "I should consider the passage down, to be certain Death, in nine attempts out of Ten. I shall therefore no longer talk about it as a navigable stream". 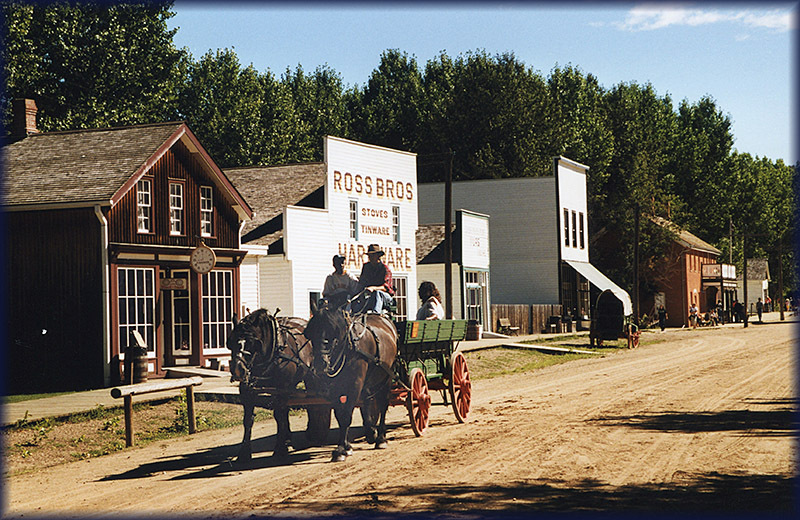 His trip down the river convinced him that Fort Langley could not replace Fort Vancouver as the company's main depot on the Pacific coast. 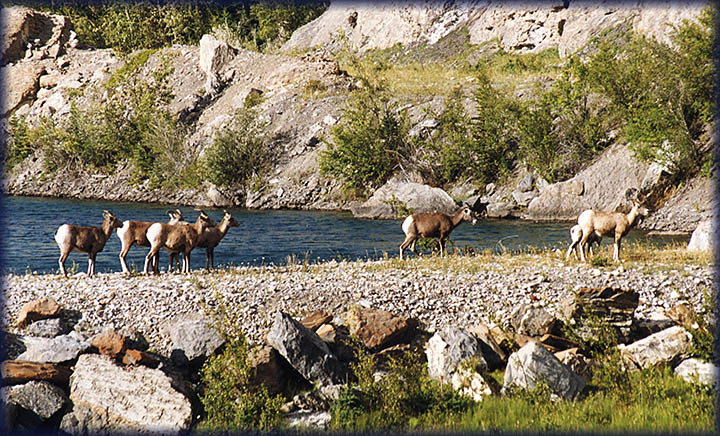 This river has been designated a Canadian Heritage River for its natural and human heritage. We came across these loghouses somewhere along the road, cannot remember the exact location. 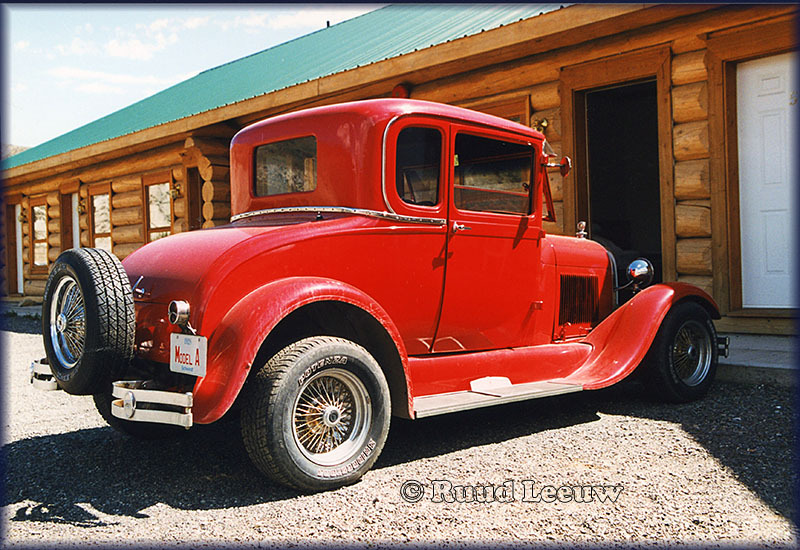 Driving these roads we also came across some fairly vintage automobiles. 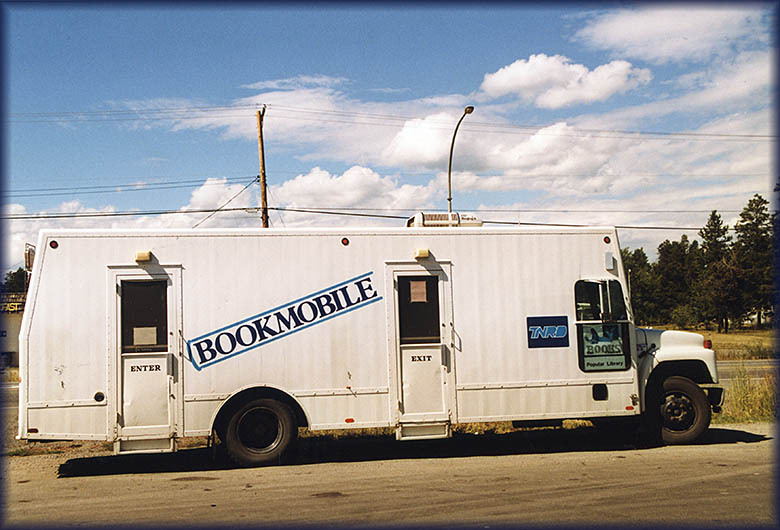 Another remarkable automobile is the 'Bookmobile'! The country along the Fraser River, south of Prince George, we saw a lot of cattle country around us and horse farms. Some were large settlements, others appeared very small. Near Kelowna we visited the O'Keefe Ranch in a blistering heat. 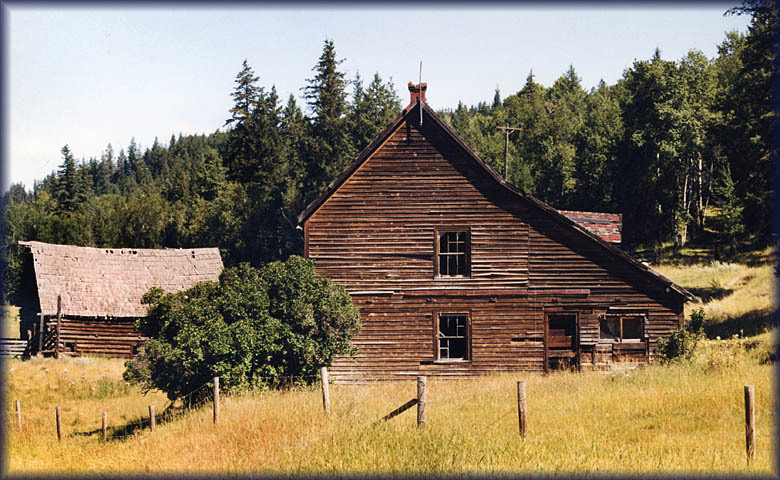 The O’Keefe Ranch, founded in 1867 was operated by the O’Keefe family for the next 110 years. 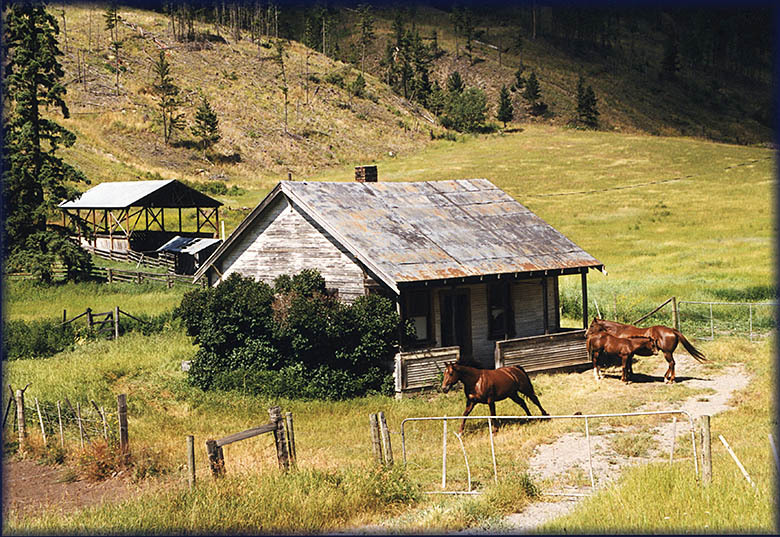 In its earliest days, the ranch was at the end of the wagon road into the Okanagan Valley and the site of the stage coach depot in the valley. 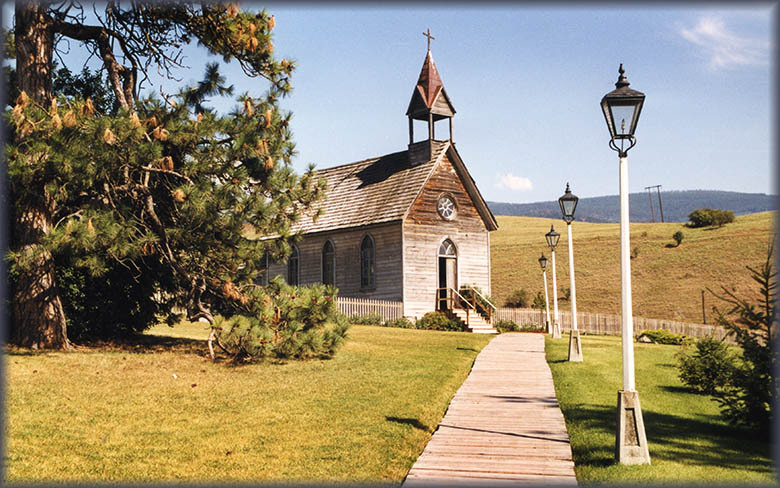 Like most of the early ranches, it was a small community, with a Post Office, blacksmith shop and even its own church. 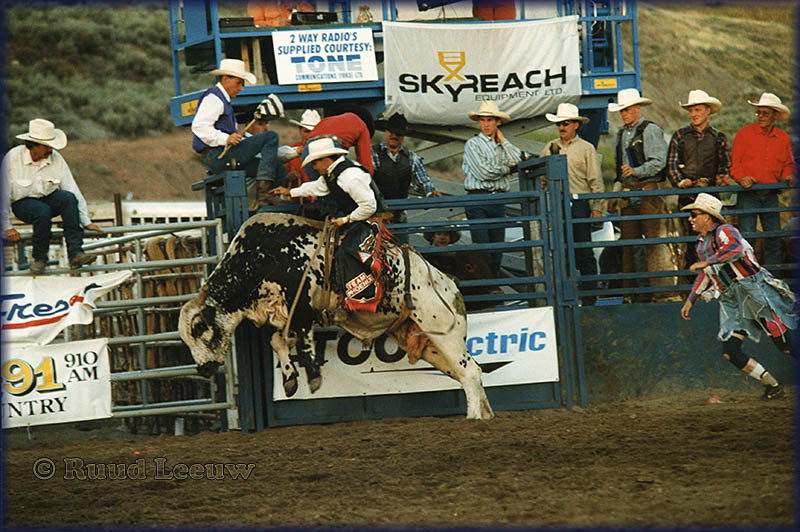 The 1870’s and 1880’s were the days of the open range, when thousands of head of cattle roamed the unfenced bunchgrass ranges of the Okanagan, Thompson and Cariboo regions. The O’Keefe Ranch attracted young men from all over the world, but among the finest cowboys in the Okanagan were the native people. 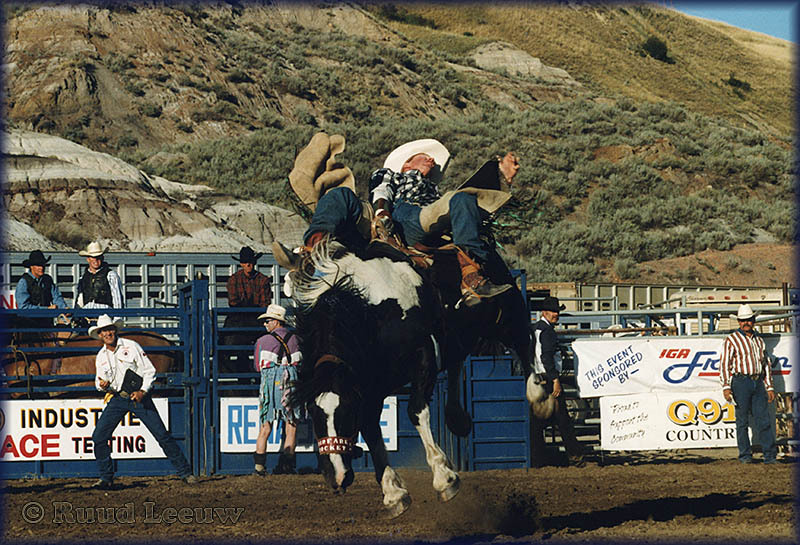 Excellent horsemen with a deep knowledge of the country, they made wonderful stockmen. From the warm (hot!) Okanagan Valley we moved to milder climes (and cold nights!). The first park we visited was Revelstoke National Park. 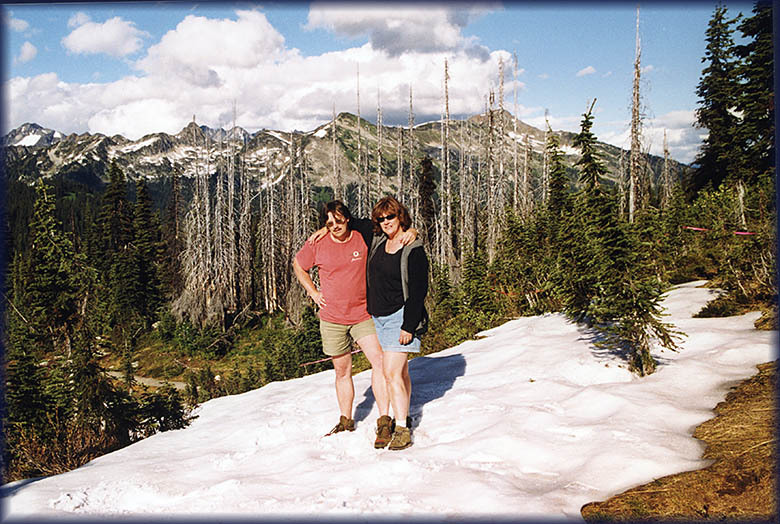 We hiked a trail, but noticed some trails were still closed by snow which had fallen the previous winter. Imagine: it was August now! We also visited Yoho Nat'l Park, which had a lot more visitors. To find a spot on a campground one had to be there not later than 10:00 a.m. and that was too early for us. 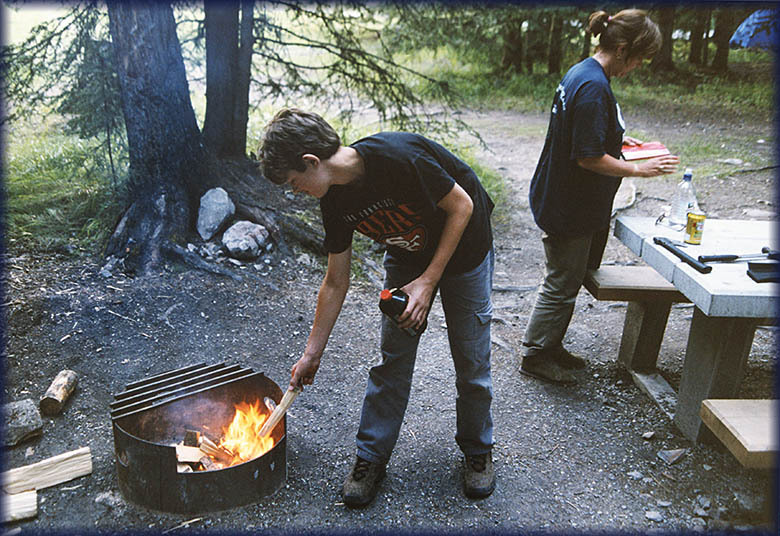 We found a spot on a primitive campground (Monarch Campground) and went to exploit the Park. We came across some impressive waterfalls and some brilliant lakes. 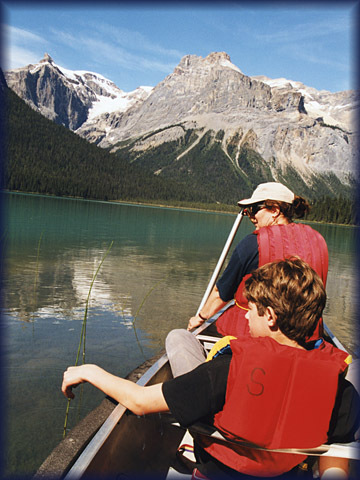 It is wonderful to hire a canoe and do some paddling on a lake like Emerald Lake. So peaceful (if you don't run into an argument about how to paddle..). 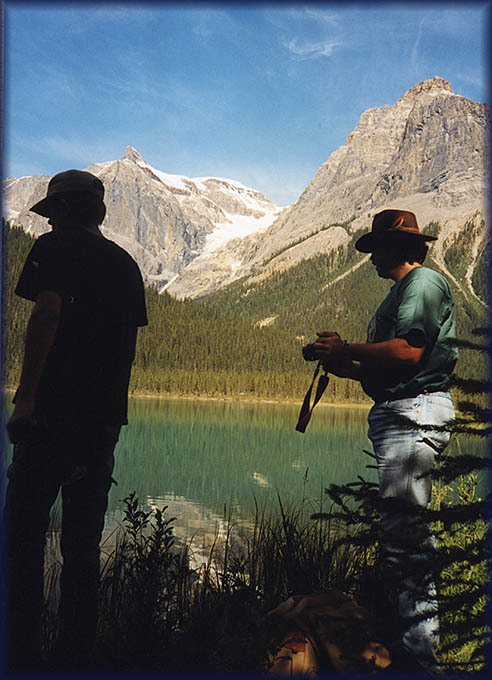 Yoho NP was established in 1886 and is one of 42 national parks in Canada. Yoho represents the western slopes of the Rocky Mountains region, and is also a Cree expression of awe and wonder for this place of rock walls, spectacular waterfalls and soaring peaks. In the shadow of the Great Divide, Yoho holds the secrets of ancient ocean life, the power of ice and water, and unique plant and animal communities that continue to evolve today. 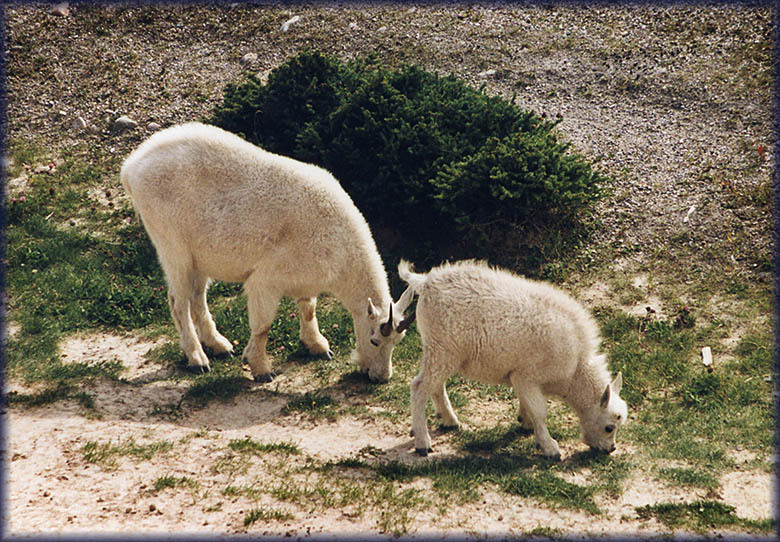 We continued over the Icefields Parkway, had a look at Lake Louise and Moraine Lake, did some hiking and enjoyed much better weather than what we had in 1986.The Athabasca glacier was huge and melting and en route we came across some wildlife, such as these mountain goats. We quickly drove on and by nightfall arrived in excruciatingly expensive and overpriced Jasper. We reluctantly accepted lodgings (I did not feel like pitching the tent) in the Overlander Mountain Lodge. 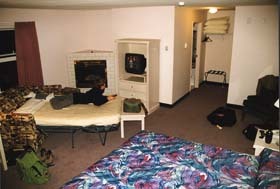 An overnight stay in Jasper's hotel accommodation is best to be avoided. 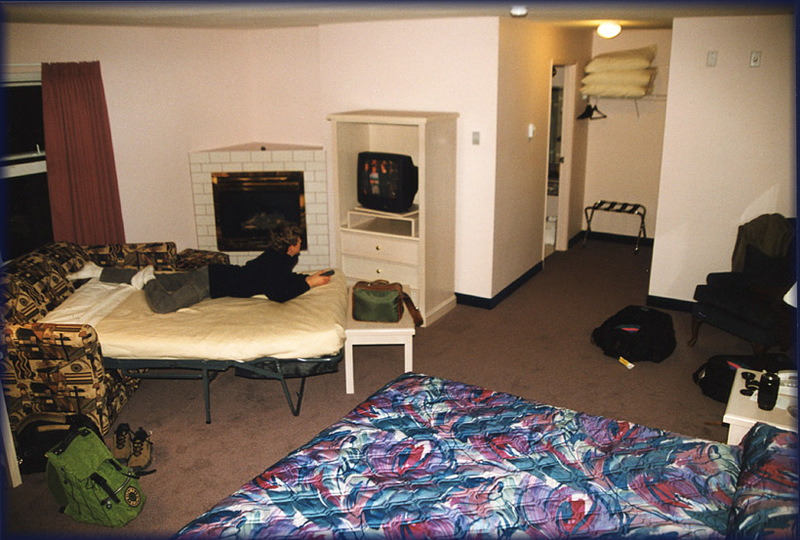 We continued to Edmonton, cancelling our intention to explore the area around Jasper (we'd been here before and Alexander didn't mind heading for town and moving closer to the shopping malls). 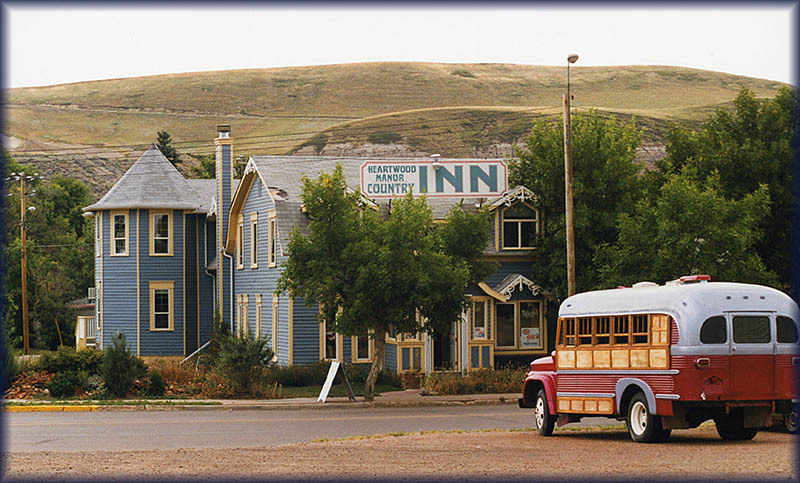 We found lodgings in the Continental Inn, suitably equipped with all modern comforts. It overlooked a large shopping mall including a Wal-Mart. 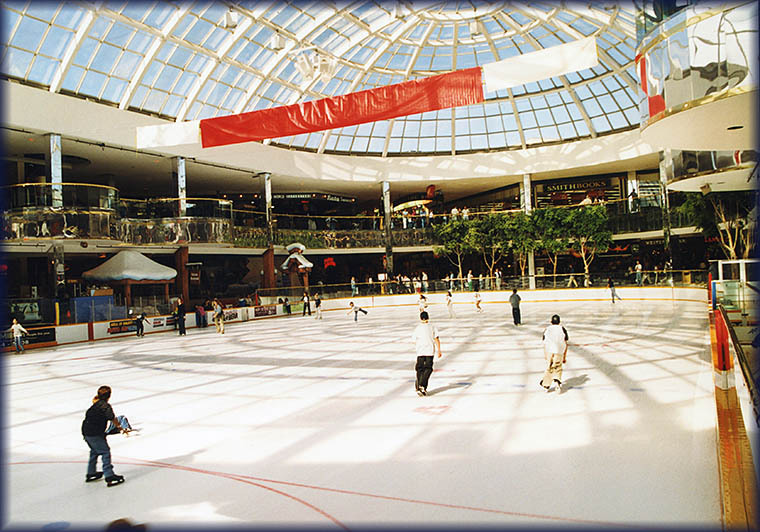 But we also went over to the 'World's Largest Shopping Mall', the West Edmonton Shopping Mall. What can one say about the West Edmonton Shopping Mall, except that it is huge, enormous, colossal, gigantic... We bought some clothes and CD's; Alexander was tempted to spend some of his money on Warhammer 40.000 goodies, but found the prices higher than at home. We also visited historic Fort Edmonton. 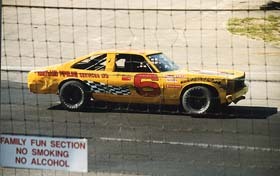 It is not in the original location, but most of the structures date from that time. 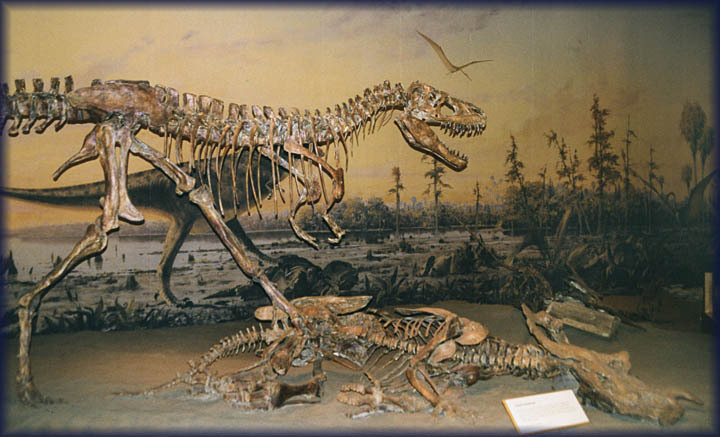 It is divided in 3 segments, illustrating different periods. 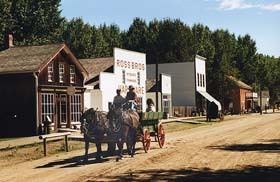 Fort Edmonton (also named Edmonton House) was the name of a series of trading posts of the Hudson's Bay Company from 1795 to 1891, all of which were located in central Alberta, Canada. 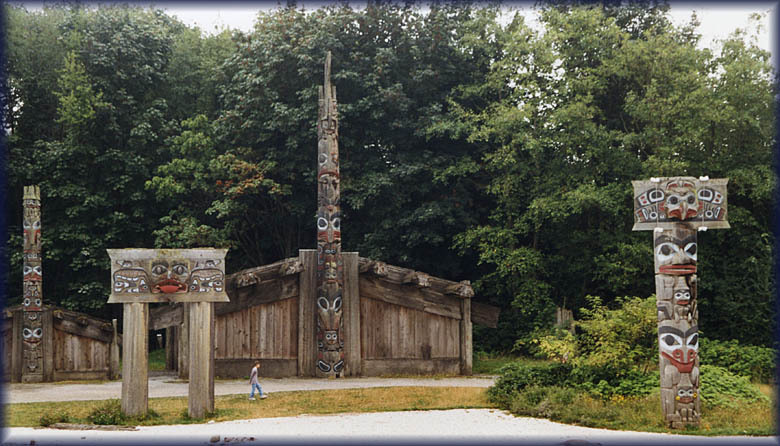 It was the end point of the Carlton Trail, the main overland route for Metis freighters between the Red River Colony and the west and an important stop on the York Factory Express route between London, via Hudson Bay, and Fort Vancouver in the Columbia District. 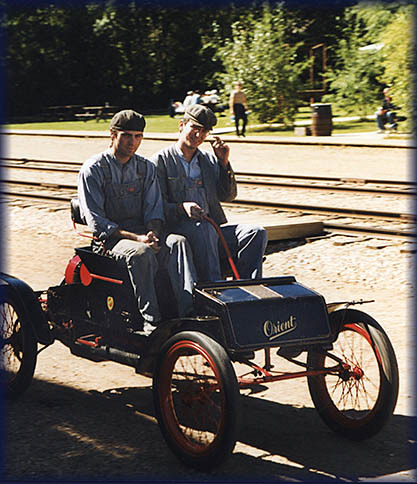 The fifth and final Fort Edmonton was the one that evolved into present-day Edmonton. 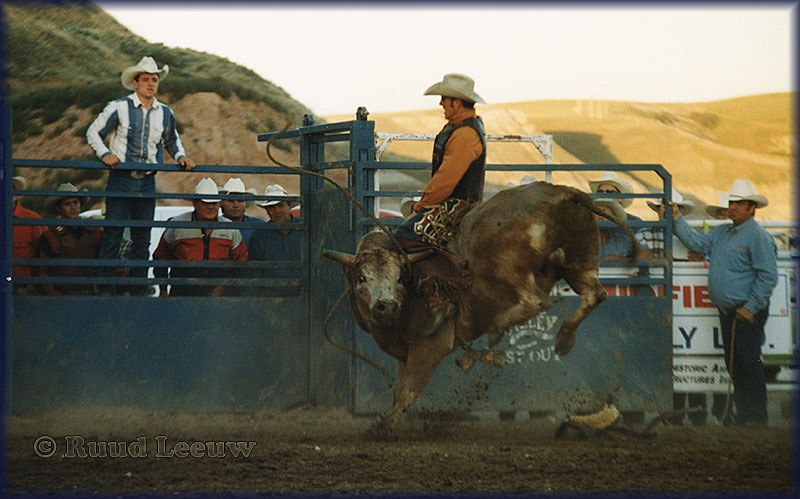 From Edmonton we drove to Drumheller and in the evening we attended a fantastic rodeo show. Initially we walked from our motel, very European, but we got lost (missing direction signs which obviously had people in cars in mind, instead of hikers) so I went back, got the car and we found the 'stampede'. The Drumheller Stampede & Ag Society was established in 1947. The first building constructed by our founding fathers was lost in a fire. 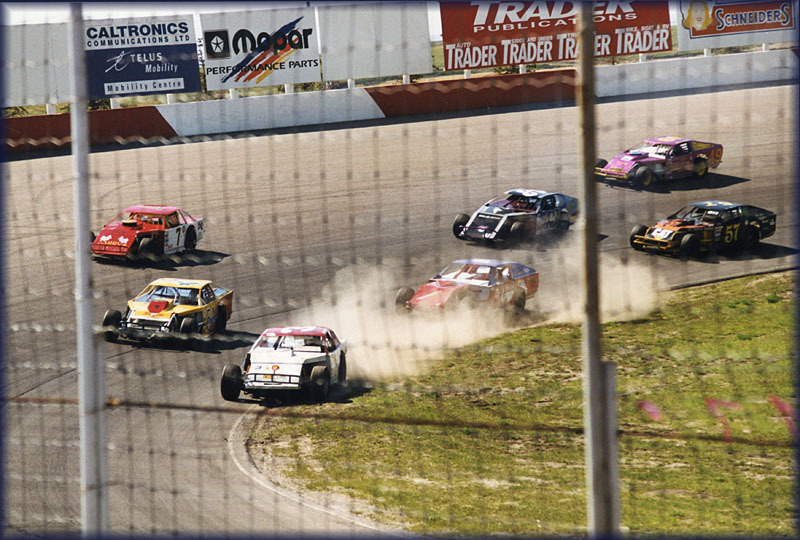 The new facility was re-constructed October 27, 1984, providing a venue to host many special events and a variety of community functions. 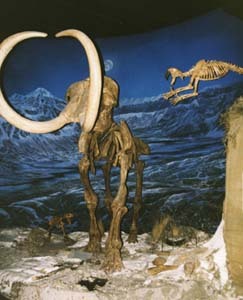 Drumheller is more famous for the Tyrrell Museum. 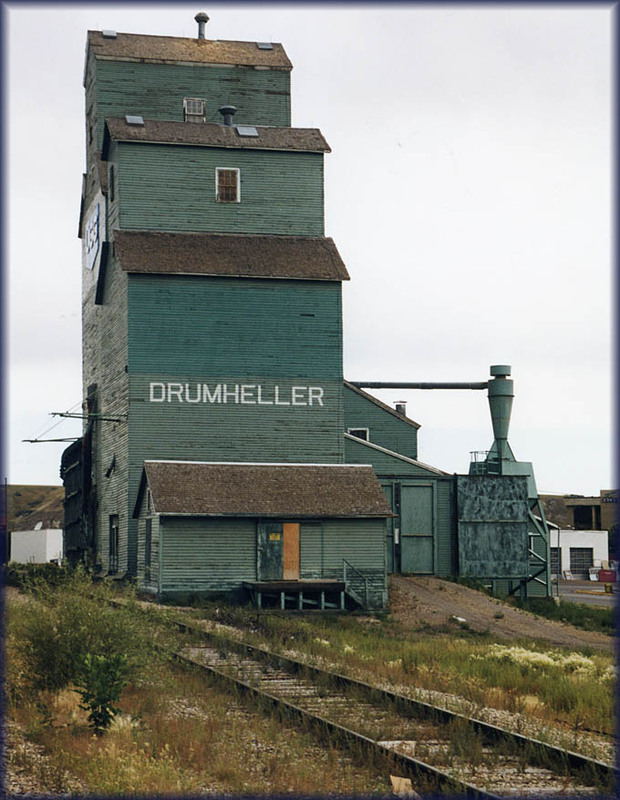 Drumheller is a town (formerly a city) on the Red Deer River in the Badlands of east-central Alberta, Canada. 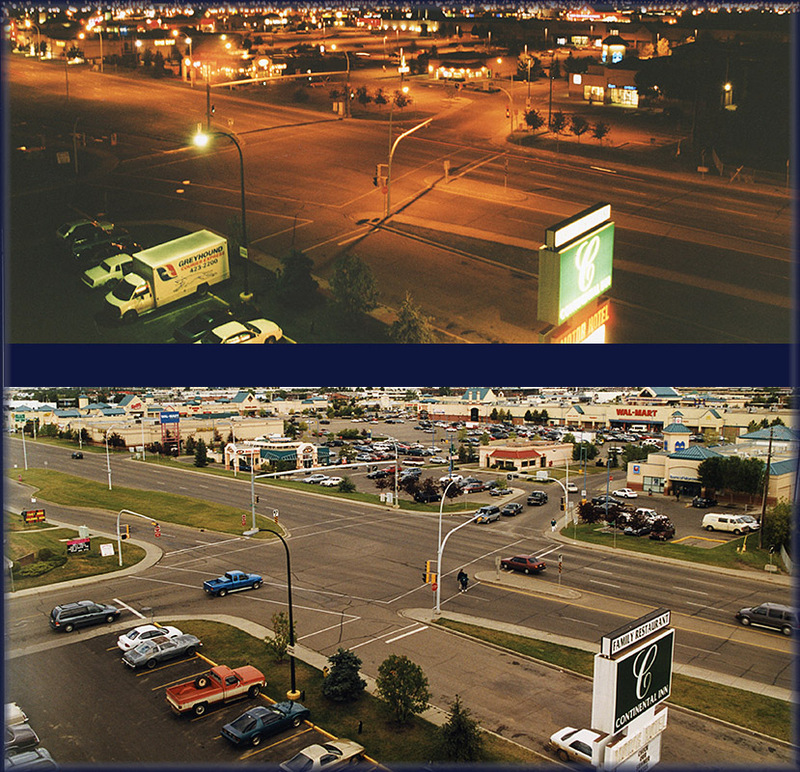 It is located 110 kilometres (68 mi) northeast of Calgary. Two final nights in Calgary, before we were flying home again. 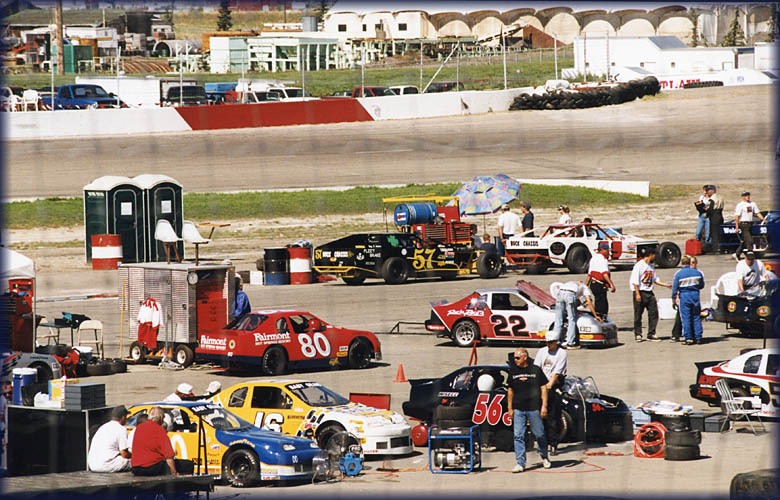 Race City Motorsport Park, also known as Race City, is a multi-track auto racing facility located in Calgary, Alberta, Canada. 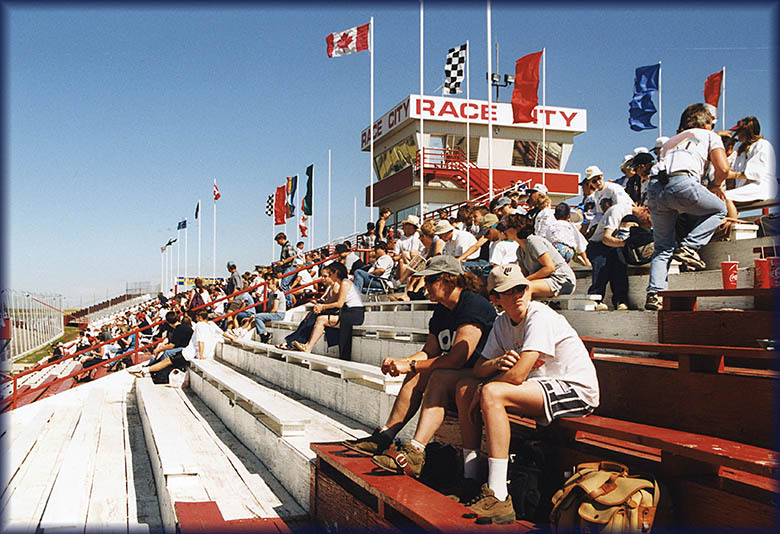 The facility features a ¼ mile IHRA-sanctioned drag strip, a 2.0-mile (3.2 km) 11-turn road course, and a ½ mile paved short oval. 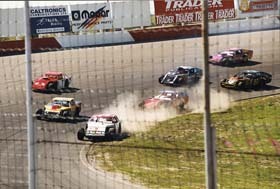 Race City is due to close around October 9th 2009. 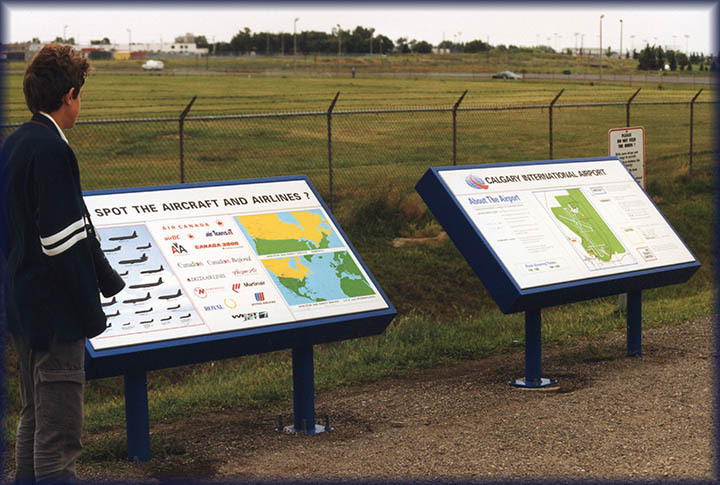 There is a carpark at the Calgary Int'l Airport where one can watch the aircraft. A brief visit here, before we returned the rental car and took our flight home, saw the weather windy and cold. Indeed a good time to go home.